Cronuts have become the treat of choice in Melbourne for quite a few, where crowds are crazy for the cream of the crop. We spoke to Brenton Lang, the man behind Rustica Sourdough, about what sends people crackers for cronuts. So what IS a cronut? No—it’s not a croissant, or even a crumpet or a crepe. The crux of the matter is, it’s a crafty creation that crosses a donut with a croissant. The crunch is created by frying layered buttery pastry—as per croissant technique—in grape seed oil, like a doughnut! As if that wasn’t criminal enough, the sweet treat is then sugared, glazed and filled with creamy custard. Wrap that around your cranium and I think you’ll find you’ve developed a bit of a crush—or at least a craving. Credit goes to New York Pastry Chef Dominique Ansel for this crunchy concoction, which he took two months to perfect. Rather than sticking to recipes that belong in a crypt, this Patissier’s creativity has been crowned the creme de la creme by craving fans worldwide. 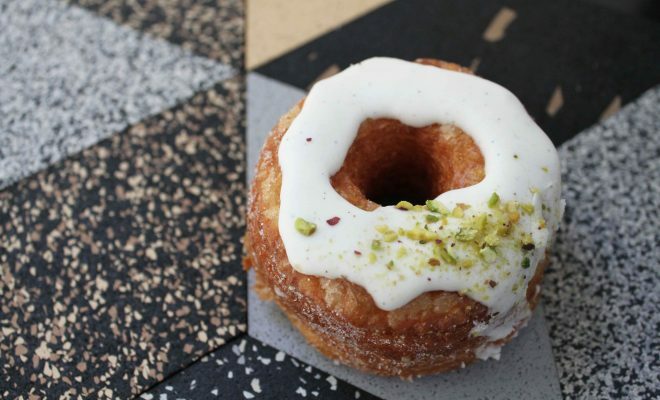 Many bakeries across the globe have been crunching up a doughnut-cross-croissant storm, but Melbourne definitely takes the…cronut! Rustica Sourdough is practically a baking institution, and definitely fits the criteria as being one of Melbourne’s best bakeries. We asked Brenton Lang what made him jump on the cronut cruise. ‘I was overseas in 2013 when the cronut craze kicked off,’ he tells us. ‘When I arrived home we had a play around and thought they were pretty awesome.’ Lang tells us the secret of making a perfect cronut is all about dough consistency. ‘The laminating of your pastry and using the right oil for frying is most important.’ Crucial, even. Some of the most popular flavours have been milo and pavlova. ‘How Aussie!’ says Lang. We tried a rather rich milk chocolate and earl grey cronut, complete with crispy meringue kisses on top. The earl grey infused chocolate custard was divine, and packed full of intense dessert creaminess. As much as we’re chocolate fiends here at GRAM, we did have a preference for the delicate berries and vanilla with Chantilly. The berry custard was fluffy and light, with just the right amount of sweetness. Of course it helps (but isn’t crucial to the cronut case) that they’re pretty as a picture. Lang tells us the flavours get tweaked every two weeks or so, ‘depending on popularity’. The wackiest cronut combos have been along the lines of white chocolate, blueberry and ginger, or lime and basil! But rather than cringing, we’re actually kind of cranky we missed out on those ones! But that’s the way the cronut crumbles. Rustica isn’t the only cafe cranking up the cronut craze. We popped by Saint Thomas on Church Street, Richmond, to find out about their cronuts. Stocked by Humble, you can find one of these crunchy, custard treats at a number of cafes around Melbourne next time you’re needing a sweet treat. Tony from Saint Thomas tells us they sell about thirty a day! With simple but deliciously airy vanilla bean or Nutella options, you better get in early to avoid the cruel fate of missing out on cronut glory. This GRAM writer is sure going to be convincing her crew to try some of Melbourne’s best cronuts! I’m sure 10cc would agree with my rendition; I don’t like cricket! Oh no. But I do love cronuts.